What’s been keeping me busy has been two relatively new sites and also maintaining MacRumors.com. My two new projects have been TouchArcade.com (cofounded with Blake) and AppShopper.com. Both are iPhone/iPod Touch related sites dealing with the many new apps that are coming out. For anyone who is serious about their websites, you’ll find that you quickly become a stat addict. Traffic stats, referral stats, income stats… they all become the most interesting things in the world. It’s easy to waste yourself away just examining your stats. If you’ve ever sold items on eBay, it’s a bit of the same feeling. A bit over a year ago I decided to post public numbers about my MacRumors stats. Historically, I’d been very secretive about my traffic numbers. For no particular reason except that most people are secretive about them. I changed my mind at one point, in part due to the example of Gawker’s network of sites. For whatever reason, Nick Denton has always been very transparent about his traffic numbers. In the end, I decided it can only help a site like MacRumors, which tends to get more traffic than respect. In the long run, I think the numbers have helped, in that they’ve been quoted in a number of places including my New York Times article. So, getting into the new sites, both have been doing remarkable well — in fact, better than I had really hoped so early on. 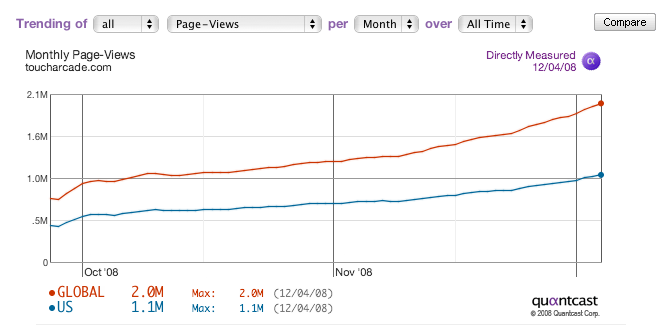 By this graph, it looks like we could approach 3 million pageviews/month in the near future, if the trends hold true. The site went from very little traffic to 100,000-130,000 daily pageviews in an instant. What’s striking about that graph is not that there was a big spike — any major exposure is going to get you a spike — but the “stickiness” of the site is remarkable. Usually there’s a substantial drop off after people hit a site in a big spike like that, but AppShopper retained a remarkable percentage of those people after the first visit. (There was recently a Black Friday spike that wasn’t nearly as sticky, but still showing a solid residual traffic). Obviously, “stickiness” is one of those factors that will determine the rate of your success or failure. If you are gaining more users than you are losing each day, your traffic is going to grow. Meanwhile, “non-sticky” sites are going to have to keep finding new users, and it will be harder to keep them around. This entry was posted in Business, Mac Web. Bookmark the permalink. Soon after my first visit to AppShopper I was hooked on the RSS feeds. I no longer go searching for apps in iTunes. I watch for new apps (or price changes) via AppShopper feeds and make quick decisions about those I might want. When I do follow the link to iTunes, it’s because I’ve already decided to get the application. Thanks for the numbers. Very cool to see your stats. I recognize Google Analytics for the bottom image, but what is the software you are using for the rest? Hey Arn, great info in here thanks for sharing. What attributed to your huge jump in stats for the app shopper site back in sept?